This page contains a variety of activities based on Venn diagrams. 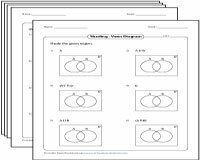 Two set and three set Venn diagrams here include cut-and-glue activities, preparing charts and taking surveys. 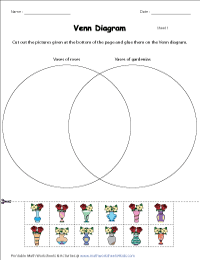 Logical data representation is made easy for children in these Venn diagram worksheets. You can also download a variety of Teacher templates right here! 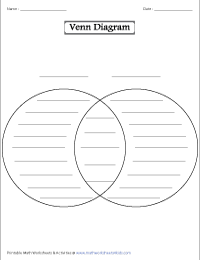 Help students use their analytical skills and study all possible logical relations between a finite collection of sets with this wide range of Venn diagram worksheets. These cut-and-glue activity worksheets based on different themes will keep children thoroughly engaged. Cut out the pictures and glue them in the right place on the Venn diagrams. 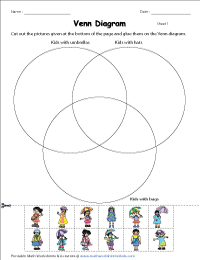 These fun-filled Venn diagram worksheets features three sets. Cut out the pictures and glue them in correct places on the worksheets given below. 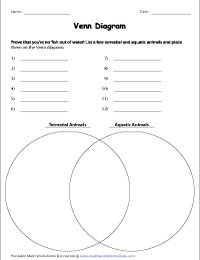 Featured here are two set animal-themed Venn diagram worksheets. 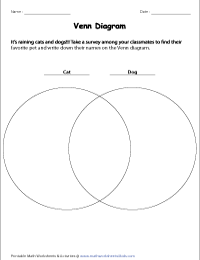 Based on the instructions provided, you will be required to make a list of animals, classify, and place them in the right places on the Venn diagrams. Take a survey among your classmates and friends to find their preferences. Collect information and write their names correctly on the Venn diagrams provided below. 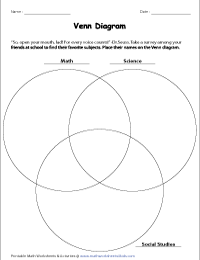 These three set Venn diagram worksheets require you to take a survey among your friends to find their favorite subjects, sport, etc. Place their names in the right place on the diagrams. A variety of two set and three set Venn diagram templates are at your disposal! Based on the data you provide, help children analyze, organize, and place data in the correct places on the Venn diagrams.